Stainless Steel 316L Wire has great general corrosion resistance. 316L is an extra-low carbon that minimizes harmful carbide preciptation from welding. Stainless Steel 316L Annealed. Rated for temperatures up to 1371-1399°C (2500-2550°F). 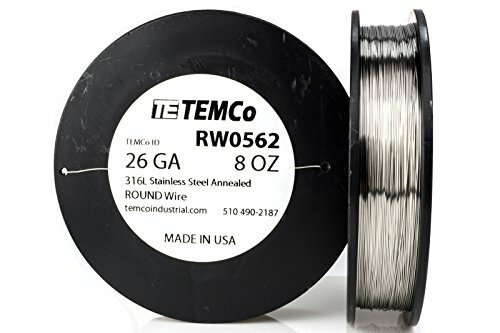 100% MADE IN THE U.S.A. All TEMCo wire is produced and spooled right here in the U.S.A. PERFECTLY TENSIONED. Zero elongation, scratches or other flaws ensure quality wire on every spool. ZERO CONTAMINANTS. Clean production environment houses the spooling process. Hands-off computerized spooling eliminates skin salts and oils.